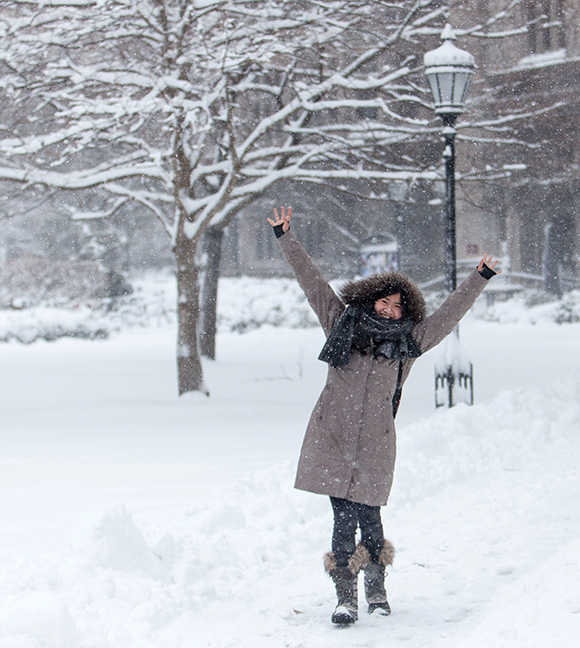 Winter brings a flurry of cheer. 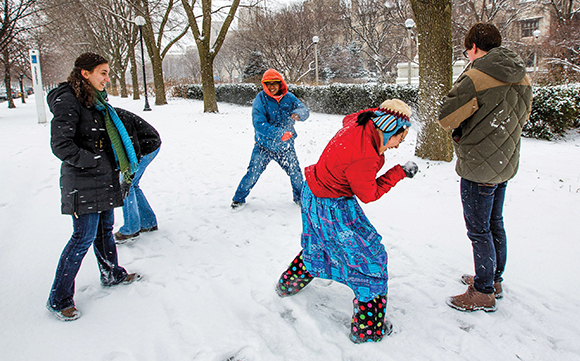 Like other denizens of the Windy City, UChicago undergrads take winter and its discontents in stride (a quickened pace, head down against the wind). Drawn to a school with a rigorous curriculum, they’re up for the challenges of an equally demanding climate. 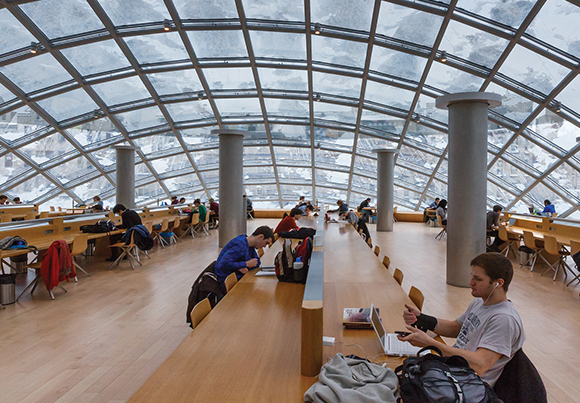 UChicagoans can take it, and they take pleasure in the accomplishment. 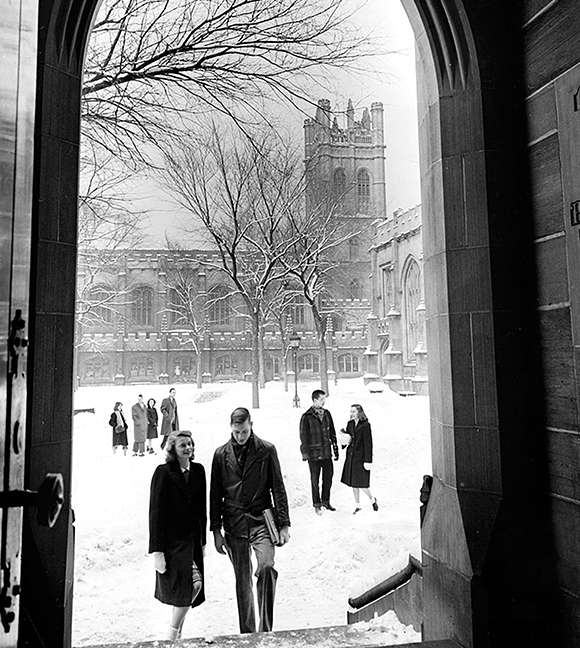 For first-years from warmer areas, the year’s first snowfall—which usually arrives as large and lacy flakes straight from White Christmas—is meltingly magical. 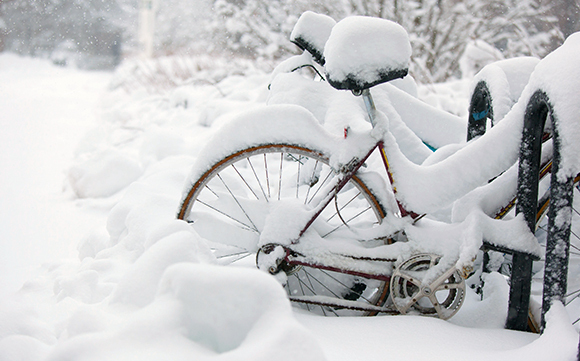 For everyone, the first real snowfall is a chance to experience the pleasures of childhood as grown-ups. 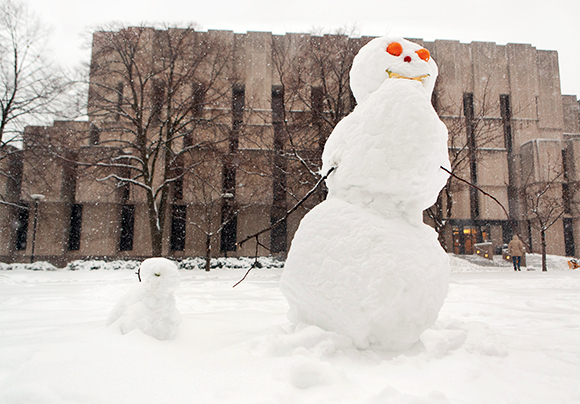 This means that snowpersons constructed on the quads are often quirky, larger (or way smaller) than life, and/or anatomically correct. 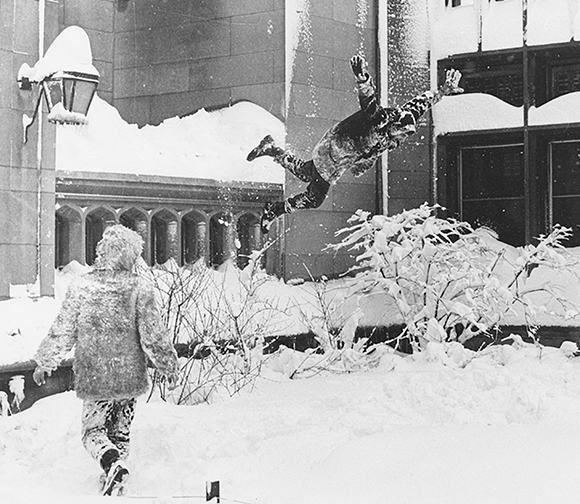 Snowball fights can assume epic proportions. 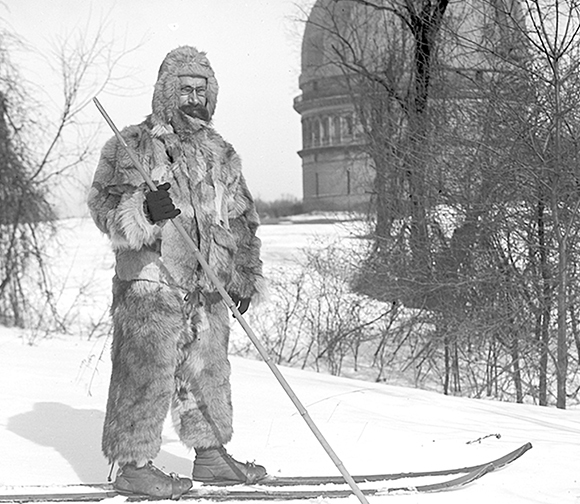 At the Midway Plaisance ice rink, coed broomball teams (Crown Sweeps, 50 Shades of Green), equipped with broom-like sticks but no skates, slip and slide in pursuit of their goals. 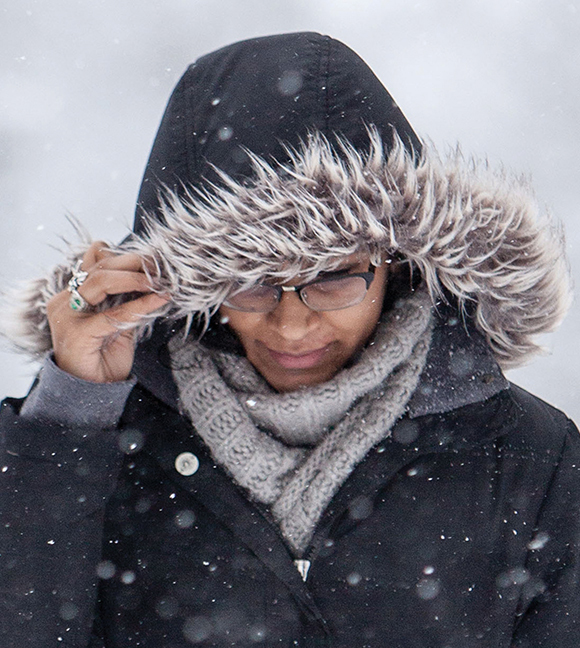 Wind chill isn’t the only factor that makes winter cooler by the lake. 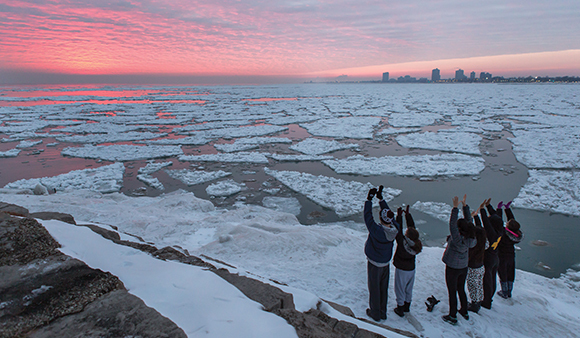 Since 1983, when the weeklong festival of morning exercises and frost-friendly activities known as Kuviasungnerk/Kangeiko began, hardy souls have assembled at Promontory Point just before dawn on a January morning. Facing east, they perform ritual salutations to the rising sun. It’s a bonding experience—or not. 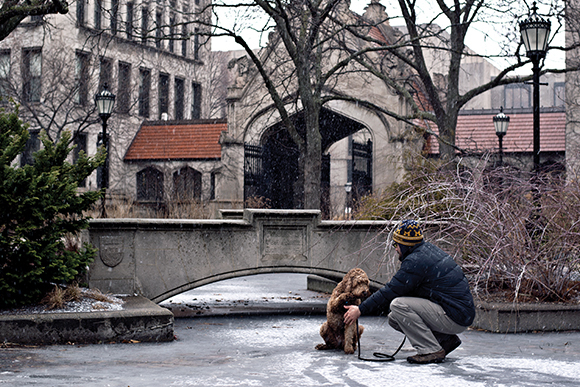 It’s cold, but winter at UChicago is about fresh starts of all kinds. 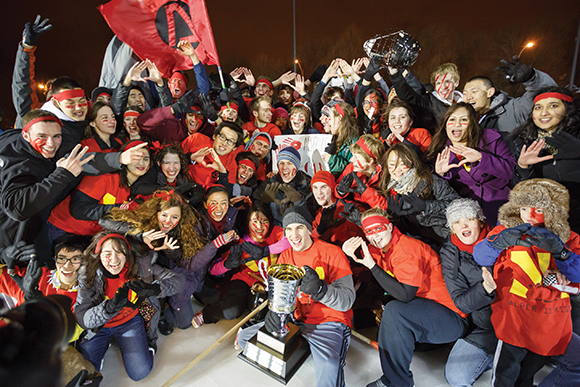 As a new calendar year and a new academic quarter merge, a set of resolutions are made. Echoing the 124 years of College classes that have gone before them, undergrads tackle problem sets and readings, write papers and dissertations, draft résumés and application letters. It’s the pleasure of accomplishment. Meanwhile, each fresh snowstorm transforms the campus into a blank slate, a black-and-white geometry that encourages the long view. 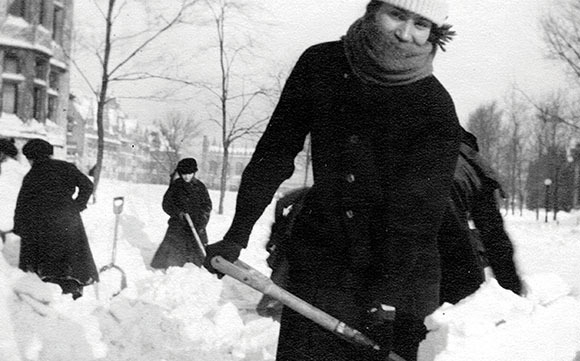 As Richard III might have put it, now is the winter of our deep content, made glorious summer by both fun and work.